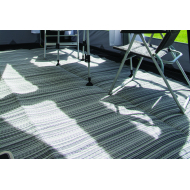 Kampa Continental Cushioned Carpet .The Kampa Exquisite design is a heavy duty but lightweight attractive striped weave in contemporary colours to complement any awning. This breathable awning groundsheet gives a warm, cushioned non-slip finish for comfort. The carpet is easy to fold and comes complete with carry bag.